A sense of history could be a great asset. It could be a painful burden too. It depends on how we decide to carry it. India is a country whose civilisation started in the pre-historic times and is still living. All the civilisations that started the journey with her, or a few centuries before or after, have shrunk to museums. India is so steeped in history that we scarcely value the historic monuments and ruins that are spread across the length and breadth of the country. Every village has some history. Every city has ruins of some medieval or ancient palaces and forts. There are many living temples especially in the south and eastern parts of the country that were built a thousand years ago. The north and west is filled with palaces and beautiful mausoleums of the Muslim era. The Archeological Survey of India and its counterpart in different states have not covered even 10 percent of our historic monuments. We can see how historical monuments are vandalised, appropriated or encroached on. In history, we study about marauding hordes that invaded our land and laid waste to magnificent cities, burned ancient universities and demolished temples. Yet, no invading barbarian tribes would have done as much damage to what we are doing now to our heritage. Bricks of ancient forts get stolen to make gaudy houses, walls of mausoleums have ‘I love you’ messages scribbled over them, ancient murals are disfigured, and sculptures get disfigured regularly. Adding to this is the administrative apathy that has scant regard for history. In my hometown, there was a stage that was built for Gandhiji’s visit in early 30s. In any other country that would have been preserved for future generations. But the municipality found it prudent to build a thatched bus stop at this place. One could not blame them, for the previous governing council had demolished the 300-year-old royal stables to build a shopping complex. I have been horrified by the action of many temple authorities who white wash ancient murals and put bathroom tiles as a part of modification. The historic Cheraman Masjid, the first mosque outside Arabia in the ancient port city of Muziris in Kerala, was knocked down a few decades ago by the Masjid committee to build a concrete structure painting in kitschy colours. Same is the case with age-old churches and gurudwaras. Taking a walk through Old Delhi is a heart-wrenching experience for anyone with a sense of history. In any other country, these would have been prime tourist attraction. Instead, these streets look like the black and white footage of post-second World War cities that were carpet bombed. Grim, dirty and stinking, one can only imagine how beautiful it would have looked at the time of Mughals. Tamil temple gopurams that have exquisite sculptures are painted like a Disney theme park. It seems the painting contractor has not spared a single shade of colours in the paint company’s catalogue and has randomly applied it wherever he pleases. The irony is that the people who take to the streets against even Supreme Court orders that strike down regressive practices have no qualms in accepting this vandalisation. Most of our museums are in a pathetic state. A visit to any European museum will make us understand how primitive our exhibition practices are. How every painter, sculptor and writer in Europe is celebrated is something we must learn from. A Kailasa temple, Brihadeswara, Kanchipuram, Srirangam, Padmanabha, Konark, Halebidu and countless other temples have thousands of sculptures that would have amazed a Michelangelo. How many Indians would even have heard about the sculptors such as Manibalaki, Mabala, Ketana, etc who carved the poetry in stone called Channakesava temple of Belur in Karnataka? 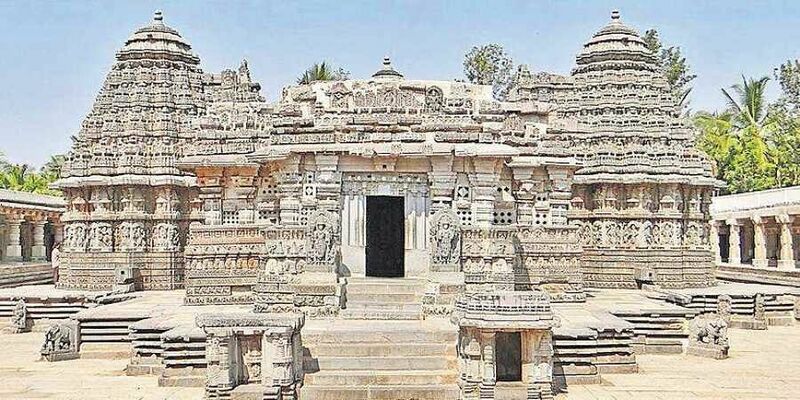 How many would have heard about the legendary architect Kokasa who built Kailasa temple? Or about Kunjara Mallan Raja Raja Rama Perunthachan? If you are wondering who the last-mentioned architect and sculptor was, he designed and built Brihadeswara temple of Tanjore a thousand years ago. Indians pay thousands of Euros to admire the Statue of David by Michelangelo, who undoubtedly is one of the greatest artists in the world. However, I have watched the same Indians casually walking by the gigantic statue of Gommateshwara of Sravanabelagola, built a 1,000 years ago. One can find people clicking selfies and munching potato chips in its holy precincts, with no sense of aesthetics. If any reader must Google to find out where Sravanabelagola is, it just proves my point about our lack of sense about history. In the temple of Sri Padmanabhan in Thiruvananthapuram, tourists are happy with a quick darshan and a discreet inquiry about the buried treasure. Hardly anyone pauses to admire the musical pillars that the sculptors would have spent years to perfect. Do we have a tourist circuit in Ujjain for Kalidasa like the tour of William Shakespeare’s London? It is high time we changed how history is taught in schools. I remember pouring over countless pages of Delhi Sultanate or Mughal Empire in my high school history. The only problem was the borders of Mughal Empire ended a thousand kilometres north of where I lived. There was nothing around me to remind me about the greatness of Mughals. While what was there around me was rarely thought of. It was in my late 30s that I discovered that the great Tamil epic Chilapathikaram was written in Kodangallore, the ancient Chera capital 40 km away from my hometown. The history teaching has to be localised. Lore and legend should also be taught along with mundane dates of some king’s reign or some obscure wars. It is only when each citizen is aware of how much history his humble town can boast of, will every Indian start feeling proud and make the knowledge of history an asset. Well said ... aware of Past & Collect from the past in right way ..